Making grill smoked chicken isn't all that hard to do. All it takes is a little knowledge, some chicken breasts, and a charcoal grill. My favorite for grill smoking is the Weber kettle grill I bought from Amazon.com. It was shipped quickly and arrived in great shape! When smoking in a charcoal grill, the coals need to be positioned to one side of the charcoal grate. Weber makes charcoal baskets just for this purpose, or you can place a brick about 6 inches from the side of the grill to keep the coals in place. To make really good smoked chicken in the grill, you just need to make the proper preparations. 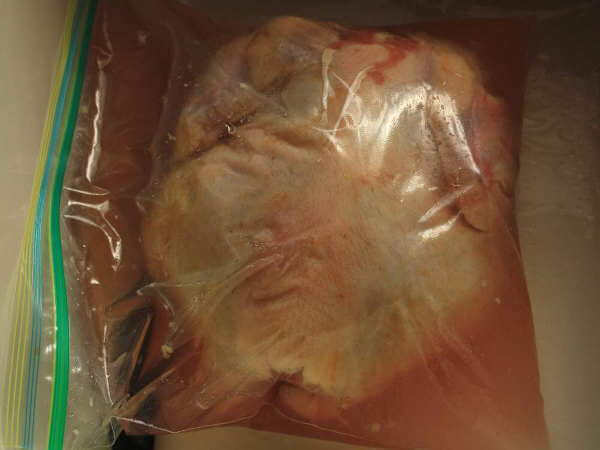 Brine the chicken breasts to enhance flavor and ensure juiciness. Season the chicken with some spicy dry rub. Smoke the chicken, being sure to monitor the internal temperature. Remove the chicken at the proper temperature, and let it rest. Serve the juicy, smoky chicken. 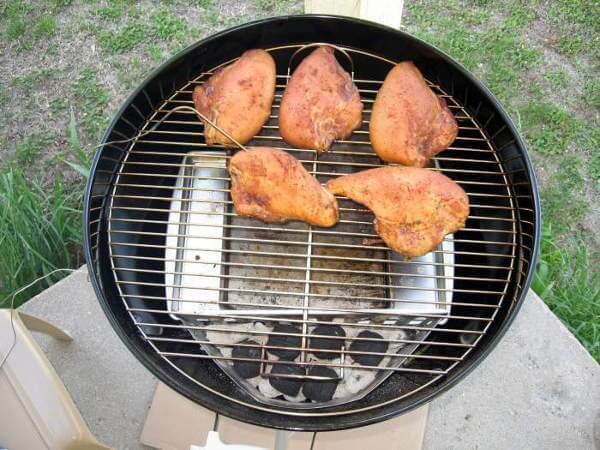 Improve Grill Smoked Chicken With The Magic of Brining! Brining chicken makes a world of difference in its quality, whether it's smoked, grilled or roasted. The salty brine actually changes the structure of the proteins so the meat holds moisture better. In addition, the texture is improved and the flavor is enhanced. Before going into the grill, it's a good idea to add more flavor with a coating of your favorite homemade dry rub. Since the chicken is already plenty salty from the brine, make a salt-less dry rub. Position the charcoal to one side of the grill for smoking near 225 degrees Fahrenheit. The food is placed on the opposite side. For higher temperature indirect grilling, place two piles of charcoal on opposite sides of the grill, with the food placed in the middle of the grate. I like to place a drip pan below the chicken to catch the juices, keeping my grill a bit cleaner. Place the chicken on the grill so it's not directly over the charcoal. Make sure that the thermometer probe is centered in the meat, not touching bone. I purposely place the piece pierced by the thermometer probe closest to the hot coals, since that piece will get done quickest. After three hours, the grill smoked chicken reached an internal temperature of 160 degrees Fahrenheit, which is the point I like to remove them. If the chicken gets much hotter than that, the protein fibers will start contracting, squeezing out moisture and making the meat tough. The beautiful brown color is from the hickory wood I used for smoke. It added a really nice flavor to the breasts. Not overpowering, but just right. I actually removed a couple of pieces of hickory from the charcoal when the wood started smoking, because it seemed to be putting out an awful lot of smoke. Don't be afraid to follow your instincts when smoking food. If a recipe calls for a certain amount of wood, but you feel it'll make the food too smoky, remove some. It's always better for food to be under-smoked than too smoky.